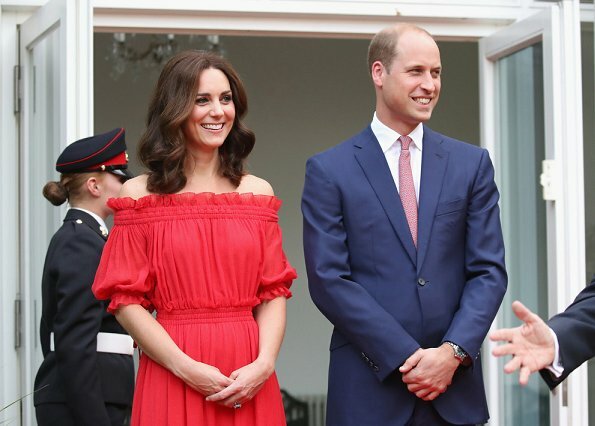 Prince William, Duke of Cambridge and Catherine, Duchess of Cambridge attended The Queen's Birthday Party at the British Ambassadorial Residence during an official visit to Poland and Germany on July 19, 2017 in Berlin, Germany. 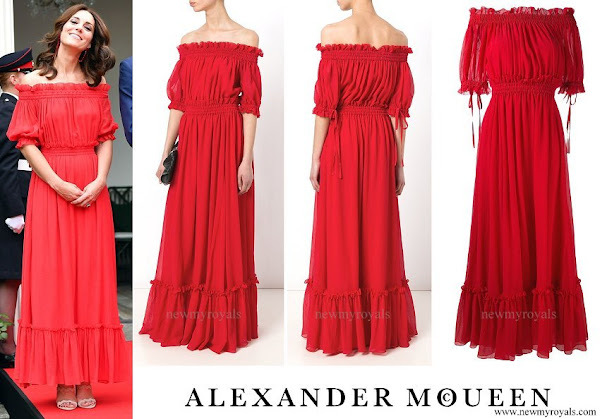 The Duchess wore a Off-the-shoulder shirred cotton and silk-blend gown by Alexander McQueen. Not crazy about the dress, not just on her but on anyone. I agree. On someone with a less-than-pin-thin figure it would be a disaster. It helps that the color is gorgeous, and she looks gorgeous in it. And the earrings are perfect with the (questionable) dress, different than a lot of her other jewelry, and just a really nice touch. But the dress is a little bit costumey and tacky, especially in this setting, in my opinion. she looks tierd and bored! Tired and bored??? Every single photo shows her smiling, happy to be there. I certainly do not see what you do. Barbara, me neither. 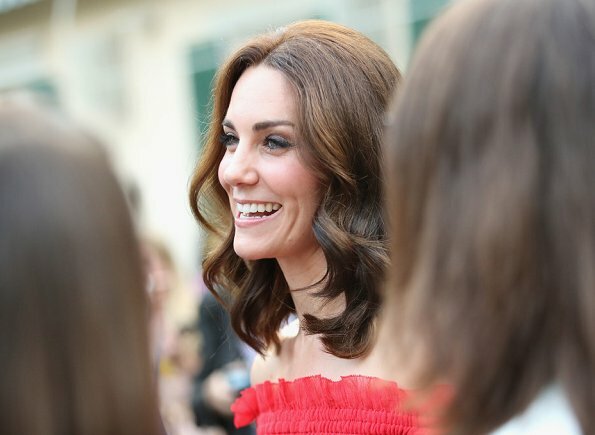 Catherine looks gorgeous! She does look tired, not surprising with every day packed with several events. I bet she will be glad when the tour is over. A like her off the shoulder look. Love how she's gone from day look to this relaxed and fun look. She certainly looks like she's having fun on this tour, smiling and engaging, it's a joy to see ! I like the dress but i realy hate the middle parting of the hair, looks so childish and so not stylish. I it is good for ones but not every day please. Horrible dress. It might be McQueen.... but still... it's horrible. Oh well - I'm going out on a limb here. 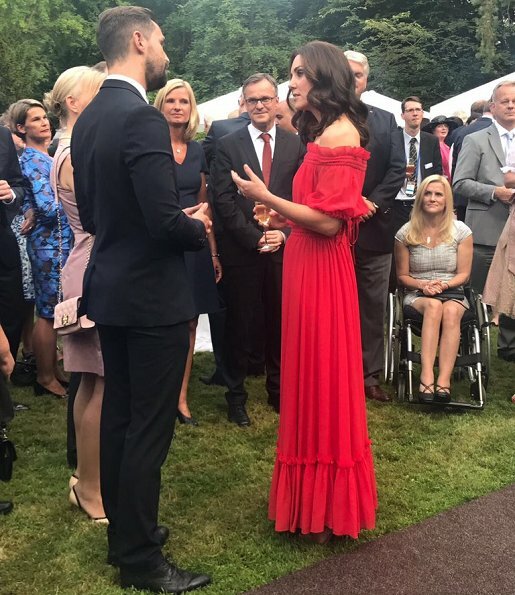 I like this dress very much - the vibrant red suits her, I like the slightly casual but dressy feel to it (looking at the other guests it's not a really, really formal occasion) and I like her earrings as well although they are slightly hidden by her hair. I like her hair this shorter length. The only thing I'm not keen on and this is a general comment, not specific to this occasion, is the way she does her eye make up - I find it a bit hard and dated. But overall, I think she looks good and I must say I can see absolutely no signs of boredom in any of these pictures. Agree about the eye makeup. It's heavy and aging. Je n'aime que les boucles d'oreilles. La robe m'ennuie. Les boucles d'oreilles ! Quelles boucles d'oreilles ? Elle les cache ! 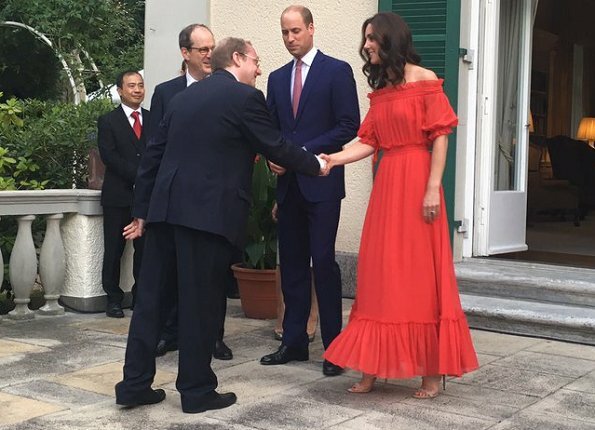 Catherine Porte mieux la robe que le mannequin Mais c'est une robe chiffon ! 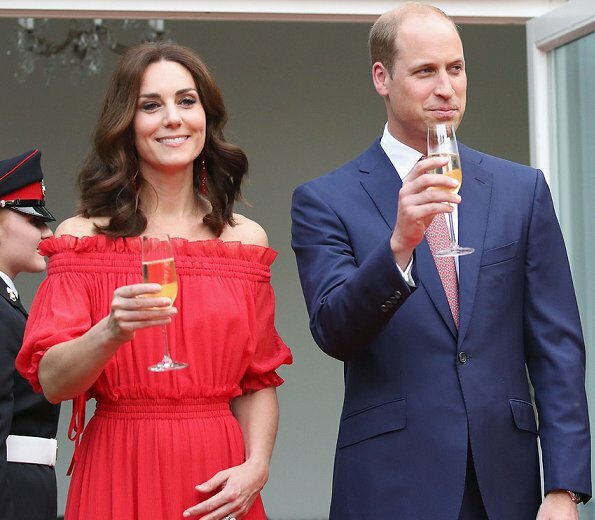 There is something about this dress that does not convince me, is a little folksy/peasant like for a cocktail dress. I do love the color, and I won't dare say that she looks bad, just not fabulous. Love the hair, and she looks happy and engaging. 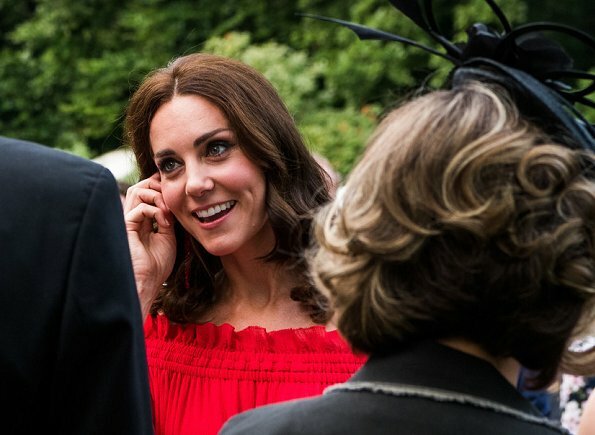 Catherine looks wonderful in red. Love her hair styled like this. One of her better looks for me. There´s nothing wrong with the dress, but everything wrong with the styling. This is a super casual summer dress fit for the beach or a garden picknick. It is not well suited for a reception or party, or anything evening or any function where men attend in suits. And it really needs to be worn with flat shoes so that it has the right length, as shown on the model. The dress looks super weird with heels. She does look tired, but not bored. You got it to the point, @Vanessa S, it's not the dress, it's the styling. The shoes destroy the whole idea of this hippie-chic Ibiza Style summer party dress. 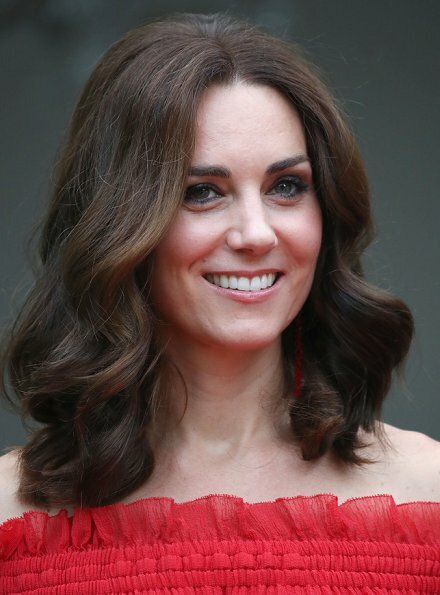 Same for the hair, the style would have needed another hairstyle than these big boring blow dried waves. Straight hair hold back with braids, or a casual, somehow 'untidy' updo would have looked much better. 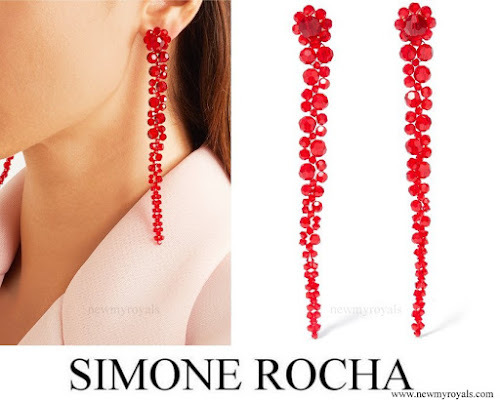 The earrings match the color, but not the style, they should be bigger and more playful, like oriental or ethnic style earrings. Her stylists should know this!! Sometimes I ask myself, how is it possible, that some of these royal stylists don't even know the basics of fashion and style. ik vind het een leuke jurk ,ieder heeft een andere smaak !!!! wat ik wel erg vind dat ze heel hatelijk zijn!!!!! 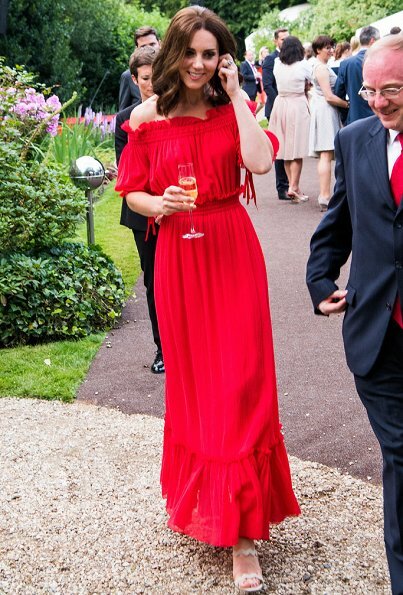 Well, she won't get lost in a crowd in that blaring look-at-me red and as the only person in a long dress. It is all a bit much as an attention-grabber. She looks great in this dress. 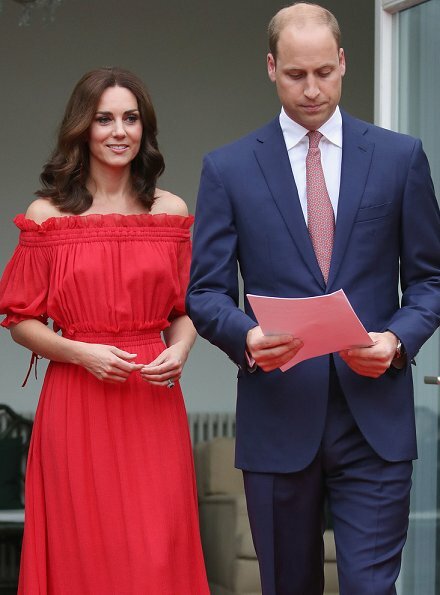 I love the colour and the slightly casual dressy look which seems in keeping with the event. Contrary to other opinions I think the heels improve the length as It just looks strange at floor length (as well as being risky to walk in). Her hair is beautiful. The dress is just to, well, red. I love this dress. What a refreshing look. 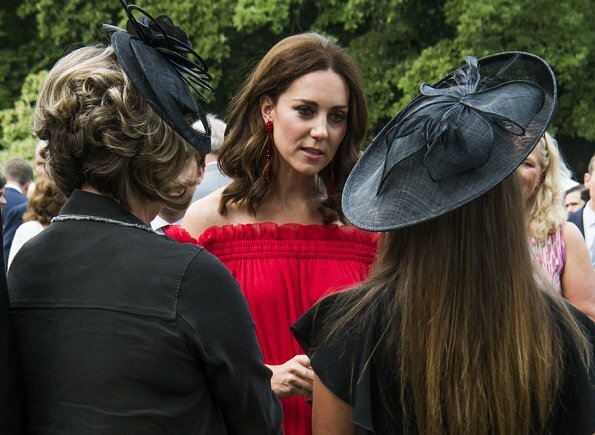 I love Kate but her 'fashions' seem to be mailed in. She kinda needs a sense of bounce, style and fun. Her clothes seem generally dull and don't seem to suit her. Maybe somebody else picks them out for her image, but something is 'off'.